Screen Pages specialises in integrating Magento with order management, fulfilment and ERP systems for efficient, seamless order processing and effective inventory management. Screen Pages has integrated Magento with many of the leading POS, fulfilment, back office order & warehouse management systems as well as direct commerce and mail order software packages, including Netsuite, Navision, SAPB1, Brightpearl, Futura, Eurostop, Prima, Khaos, Maginus, Columbus, Orbital, Spark, Mailbrain, Elucid, Exact Abacus and many others. Having an integrated Magento eCommerce solution can affect everything from being able to rapidly process orders, provide slick fulfilment and returns services to your customers and gain useful insights into what your customers are doing. Screen Pages offers enterprise integration services to meet just such needs. 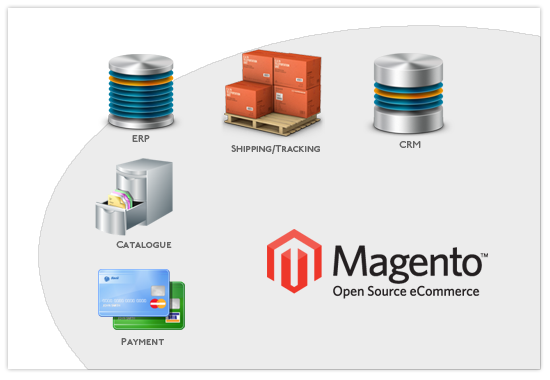 We have extensive knowledge of the Magento APIs as well as experience of working with a variety of back office and point of sales solutions. Magento can scale from “batch” file downloads into your order processing systems to real-time integration with inventory systems for stock availability. It uses a variety of technologies such as XML, CSV and Web Services to provide seamless interfaces – saving time and money.